According to statistics, a CTA (Chicago Transit Authority) bus crash occurs every 36 hours. While all don’t result in injuries, the outcomes of those that do have the potential to be catastrophic. 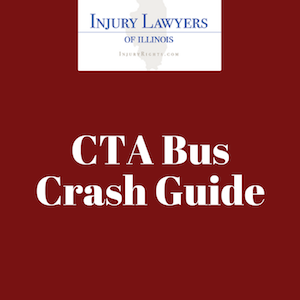 If you are injured in a CTA bus accident, there are some steps you should take in order to protect yourself, especially if those injuries are serious. Call the police. A police report will be important evidence when your attorney is negotiating your case. Collect evidence. If you are able to, take photographs of the accident scene, gather contact information from witnesses and get the names of everyone else involved in the accident. Seek medical treatment. Medical records that begin in the aftermath of an accident are an invaluable way to prove the extent of any injuries. Call an attorney. If you’ve been injured in a CTA accident, talking to an attorney soon after the accident will ensure that you have the best recollection of the events leading up to the accident. An experienced attorney – one familiar with the CTA – will be an invaluable asset, and he or she will prevent you from talking to anyone alone, which could derail your case. File paperwork with the CTA. Because the CTA is a government entity, the process for filing a claim is different, and so is the time allotted to do so. Some paperwork deadlines could be as little as 180 days, so it’s important not to procrastinate. Your attorney will help make sure you file important papers in a timely manner. Chicago is a busy city, with traffic congestion and some of the most treacherous intersections in the country. Add to that winter weather, which can include snow, sleet and ice made more dangerous thanks to the wind coming off of Lake Michigan, and it should come as no surprise that there is a CTA accident every day and a half. Congested traffic. Construction season and heavy traffic can both cause accidents that result in injuries. Blind spots. Buses are large and designed so that drivers have multiple blind spots, making them potentially dangerous companions on the road. Inadequate training. Many bus accidents involve inexperienced drivers who are not used to driving such a large motor vehicle. Inattentive driving. Bus drivers who are talking on the phone, driving under the influence or texting while driving can easily cause an accident that could result in serious injuries. Poor bus maintenance. Buses require regular repair in order to operate without incident. When tires, brakes and other safety features are not regularly checked, an accident becomes more likely. What Are Some Top CTA Bus Crash Injury Settlements? The family of a woman who was struck and killed by a car, then hit again by a CTA bus, was awarded $4.3 million in a settlement that was negotiated with the CTA. The CTA settled with a woman whose feet were run over by a CTA bus, resulting in permanent disability, $6 million after the case was settled following mediation. A 28-year-old factory worker was awarded $11 million from the CTA after the car he was riding in was hit by a CTA bus driver, leaving him with a severe head injury and the mental capacity of a child. What Can Hurt My CTA Bus Crash Case? The CTA rarely, if ever, settles a case when an injured party makes a claim. Instead, they gather detailed information from you through requested paperwork in an effort to learn more about you, and gain evidence that may implicate you and expnorate them. They may also use witness statements and your own recorded statement to discredit your case. In addition to talking to the CTA, failing to file paperwork on time can also hurt your case. Talking to a lawyer – and not the CTA – may be a more effective way to bolster your case. The right attorney can help negotiate your claim successfully with the CTA, and should work hard to make sure that you are fairly compensated for your injuries and any damages. How Long Do I Have to File a Lawsuit for My CTA Bus Injury? Because the CTA is a government agency, the statute of limitations is short. It’s important to act fast if you were injured and plan to file a lawsuit because any evidence should be gathered as soon as possible. Filing a personal injury report with the CTA as quickly as possible may be the smartest move you can make. What Are the Most Common CTA Bus Injuries? When winter weather envelops Chicago, icy conditions can be problematic, especially for busy commuters who get on and off the bus, creating a slushy mess at the bus entrance or exit that can cause slip and fall injuries. Falls can lead to sprains, broken bones or head injuries. When buses collide with smaller, lighter vehicles, injuries can include broken bones, internal injuries, head injuries and death. For pedestrians, CTA bus accidents are often fatal. In 2015, a 51-year-old woman was killed when she was struck and dragged beneath a CTA bus that also hit several vehicles. Eight others, including the bus driver, were injured in the accident, which occurred during a Tuesday evening rush hour. If you’ve been injured in a Chicago CTA bus accident, call our experienced team of attorneys today. We are ready to take your case to trial if necessary, and you won’t pay a fee unless we win your case. Your initial consultation is free.